Soft, snuggly, fun and floppy - our adorable Flavio the plush frog Flopsie by Aurora is a customer favorite! Measuring 12 inches in length, Flavio the plush frog is made from a silky soft plush and is authentically colored. Realistic lock washer eyes give a further true to life feel, and poly bean bags in the feet give just the right amount of flopiness. 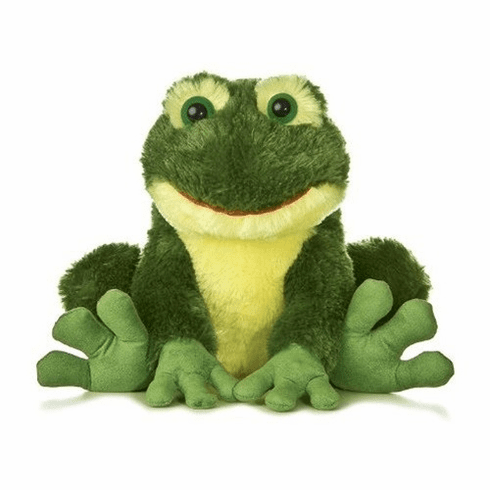 And, just like all of the quality stuffed animals from Aurora, Flavio the plush frog Flopsie is made from only all new, child safe materials that meet or exceed all U.S. safety standards, ensuring your new stuffed animal will be around for a long time to come. We suggest surface washing for Flavio the plush frog Flopsie ; recommended for ages 3 and up.